Let’s Compare Traditional Braces to Invisalign in Bowie! If you’ve finally decided to remove the crookedness and overcrowding inside your teeth, you’re probably wondering what the best form of treatment is out there. 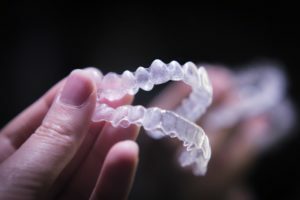 Dentists have continued to stay up-to-date on dental innovations just as much as the rest of their education, so you’ll want to confirm if Invisalign in Bowie is the best option. If you aren’t familiar with Invisalign, your dentist in Bowie is happy to make it easier for you. Soon you’ll find out the additional benefits and savings you can reap with clear aligners from Invisalign. Traditional braces have the potential to cost the same amount as Invisalign clear aligners, until you account for the additional out-of-pockets costs that come with it. Invisalign can go for about $5,000 for a complete set on average, while metal braces can cost anywhere from $4,000 to $8,000. However, metal braces require many more orthodontic visits so the wires can be tightened every six weeks or so. Invisalign lets you take home several months-worth of aligners so you can switch them out on your own every two weeks. It’s also possible for a wire or bracket to become loose with traditional braces, which will force you to visit your cosmetic dentist in Bowie sooner than expected. Fortunately, repairs are rarely needed for clear aligners from Invisalign. If you lose, break, or damage them, they can easily be replaced with the next pair of aligners in your set. This makes managing your teeth-straightening journey that much easier. When you first receive traditional braces, your dentist will go over multiple techniques to brush your teeth. This is because the wires and brackets will often catch food debris and grow plaque, making it easier for tooth decay and gum disease to appear. They’ll also show you how to floss appropriately around the additional hardware. After the braces come off, you’ll likely need a professional cleaning to ensure all plaque is removed. Invisalign let’s your remove your aligners every time you need to brush or whenever you eat. This means your habits don’t have to change just to accommodate your realigning treatment. Just remove them when you brush and eat, then remember to replace them throughout the day and before bed. Since Invisalign’s products are clear, they are much less noticeable than metal braces, making you feel more confident in your smile while undergoing treatment. You’ll also notice that clear aligners don’t have the same affect on your teeth and cheeks like metal braces do. Your overall experience should be more comfortable and without any aches or discomfort that comes with wearing braces over time. Keep Invisalign in mind during you next visit with your dentist in Bowie. Don’t let your quality of life suffer for a straighter, healthier smile! Dr. Clarine Green Hightower attended the University of the West Indies to study Natural Sciences before she went to Howard University College of Dentistry to earn her dental degree. After doing an Advanced General Residency, she worked in various practices before creating her practice in 2007. To learn more about her practice and Invisalign treatments, contact her at (301) 262-2624 or visit her website. Comments Off on Let’s Compare Traditional Braces to Invisalign in Bowie!